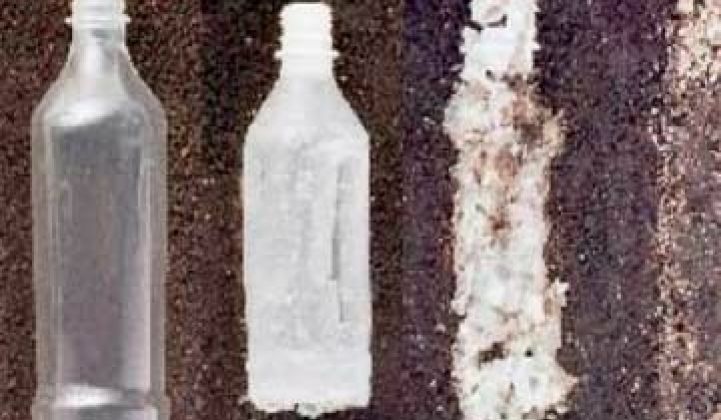 Technology, regulation and dropping costs are finally paving the way for plastic alternatives. Are bioplastics ready for their coming out party? The potential and need for plastic alternatives has become more acute in the last decade. The SPI Bioplastic Council anticipates that the bioplastics market will exceed $1 billion by 2012. Today it is half that. BASF, the German chemical giant, estimates that bio-based products already account for some $470 million in sales of such things as 'chiral intermediates,' which give the kick to its pesticides. Scientists have also devised novel techniques for cutting down the costs. Opxbio, for instance, has genetically engineered a microbe to secrete acrylic acid, a precursor to the absorbent polymer in baby diapers. Meanwhile, Cereplast produces more traditional bioplastics, but at relatively low temperatures to save energy. Then there are plastic recyclers like Axion International making railroad ties out of old milk jugs. If anything, lawmakers are prodding the market. France, Germany and Italy are trying to phase out polyethylene bags and other regions are cracking down on styrofoam. Currently, the bioplastics sector is led by Europe, with Japan in second place (very active in packaging and bioplastics), followed by the U.S.
McKinsey, a consultancy firm, reckons industrial biotech's global sales will soar to $100 billion by 2011, by which time biofuels will have reached only $72 billion. Why has plastic not attracted as much attention? First, the price of oil was very low in the late 1980s and early 1990s. But even with the rise in prices, the incumbent technology is cheap. "Bio-based plastics will not substitute for oil-based polymers in the near future for several reasons. These include low oil prices, high production cost and restricted production capacity of biomass-based polymers. These factors limit the technically possible growth of these plastics in the coming years." So wrote Patrick Navard, Chairman of the Governing Board of EPNOE (European Bioplastics and the European Polysaccharide Network of Excellence) in a 2009 forecast that sees enormous potential for bio-based plastics. Nonetheless, substituting and gaining a foothold in the market are two separate things. Based on recent announcements from Cereplast, the production capacity of bio-based plastics is projected to increase from 360,000 tons in 2007 to about 2.3 million tons by 2013, an annual growth rate of 37%. "We should keep a close eye on these figures," says Hasso von Pogrell, Managing Director of European Bioplastics. "Important major projects were delayed in 2008 and 2009 due to the financial and economic crisis. Despite uncertain data, which of course must be further consolidated, such studies are essential. The role that lightweight, conventional plastics played in the past, substituting durable materials like iron and steel in many products, could soon be taken over by bio-based plastics." Large and small companies are working toward making bioplastics and biochemicals. Startups like Cereplast, Metabolix and Novomer are in the game, and giant companies like Archer Daniels Midland, Dow Chemical, DuPont and BASF continue to inch toward it. "Big companies are not yet fully committed in the bioplastics market, but growing demand and increasing prices of oil and natural gas are driving those large companies to wet their feet in bioplastics. That's why we have seen acquisition announcements in the sector," says Scheer. "Ten years from today, all of them will be in the sector. Companies like ours, that today are relatively large, will be acquired or will work in joint-venture with these big plastic companies. We are not reinventing the wheel. Big companies have been in the market for decades and they have established distribution and supply chains. Elsewhere, IBM is working with scientists at the King Abdulaziz City for Science and Technology in Saudi Arabia to use the breakthrough in recycling plastics in food and beverage containers. Andrew Williamson, a director with the venture capital firm Physic Ventures that has seen IBM's research, said that the discovery could help solve one of the biggest challenges food and beverage companies face with designing environmentally friendly packaging. "Commodity plastics like PET are very low cost," Williamson said. "What they've come up with will have to prove its competitiveness on cost, and that remains to be seen." His company invests money on behalf of two major food and beverage corporations.